I’m a wedding and portrait photographer based in Brooklyn, New York. 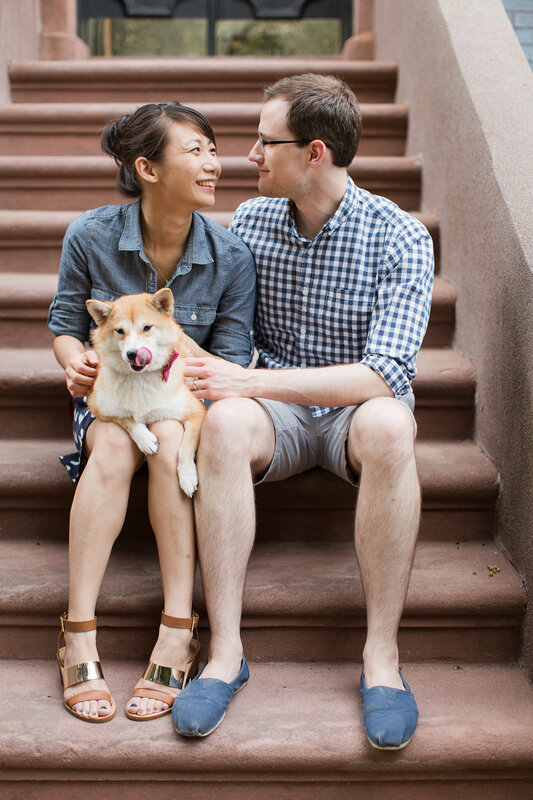 I currently live in beautiful Carroll Gardens with my wonderful husband and best friend, Robert. Before moving to New York, I was very much a west coast girl, having spent most of my life in the cities of Seattle and San Diego. I'm still getting used to having all four seasons. See what I'm currently up to (Instagram, Facebook), or what I'm currently coveting (Etsy). I have an obsessive tendency to document things. If you don't believe me, I can show you the dozens and dozens of notebooks I filled with my tangled handwriting and teenage angst in high school. Or the hundreds of blog posts I've written since college, reflecting on the current events in my life. Or now, the crazy-lady-ish way I meticulously keep up my Project Life scrapbook. When photography entered the mix, my recording instincts basically went on steroids. I always have a camera on me, and it's hard for me to ever not take photos. I like recording stuff because I know that everything only happens once, and it's the only way to accurately remember the now. I value my experiences and there's something really special about being able to relive the "good ol' days" later on. As a photographer, I love being able to help others document their stories. It's rewarding to know that in twenty years, it's one extra way for them to remember the now: The things they enjoyed and the people they loved; what they wore and where they lived; the way they laughed with loved ones and how they celebrated important landmarks in life. Most of all, I love the added dimensions of beauty, composition, and light that photography brings to the documenting process, and when all these elements come together to culminate into that "perfect moment" -- the kind that's hard to describe with words, but you know it when you see it, because it makes your heart smile. I'm obsessed with chasing after these "perfect moments" behind a viewfinder because it makes me feel alive, connected, and that there is still good and beauty in the world. There are honestly few things in life I enjoy more. So even when I've been on my feet for 8 hours and my back is threatening to break under the weight of my camera equipment, I'm still pressing that shutter button because with each click, there's a thrilling anticipation of possibly capturing the next perfect moment. Joyful. There's nothing I love photographing more than mouth-wide-open laughter. Or the quiet smile of complete contentment. I love genuine hugs (the kind that involves squeezing), and people saying "I love you" with their eyes. Candid. I like depicting life in motion. I hate posed shots, (but I might pose you into making you look candid, if that makes any sense), and am constantly clicking away to capture the in-betweens. I love photos that feel like a camera was never involved. Whimsical. Because life is beautiful when it's whimsical -- fun, mysterious and imaginative. I want my photos to reflect that kind of magic, be it a sweeping wide-angle shot, or the light sparkling at just the right angle.